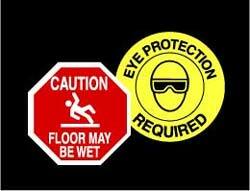 Carlton's laminated floor decals measure 18" in diameter and adhere to the floor for on-the-spot warnings. High tac adhesive keeps them securely in place. The clear laminate over these decals provides excellent durability and keeps them clear and clean. Also available in custom print (10 order minimum and one color print). Call us at 1-800-231-5988 or e-mail us at sales @carltonusa.com for a free catalog or to order any of our identification products. Carlton Industries, P.O. Box 280, La Grange, TX 78945. Tel: 409-242-5055; Fax: 800-231-5934.